Grandpa Durov's Corner in central Moscow is one of the world's few theaters where animals perform on stage alongside humans. RBTH takes a look behind the scenes. Mention Moscow’s cultural attractions and theater will be one of the first words on people’s lips. The city has been one of the world’s great champions of drama since the 19th century and a number of its theaters are known all over the world. But beyond the realm of classical and contemporary drama, Russia’s capital is also home to several more unusual theaters. At Grandpa Durov's Corner in central Moscow the main attraction is not the actors – at least, not the human actors. Durov’s Corner is one of the few theaters in the world where animals perform on stage alongside humans. "We have more than 500 animals, including some big ones, like elephants and bears,” says theater museum tour guide Lyudmila Popenko. “Fairy tales performed by animals are a great success. Tickets for some shows need to be bought six months in advance." The history of the Durov family dates back to the Middle Ages. Perhaps the most famous representative of the family was the first woman to become an officer in the Russian army, Nadezhda Durova. During the 1812 war with Napoleon, she, dressed as a man, enrolled with the cavalry and was later promoted to an officer's rank. Until her dying day, Nadezhda Durova wore men's clothes and demanded to be addressed by a man's name. The theater was founded in 1912 by clown and animal trainer Vladimir Durov. "Vladimir Durov toured the country, travelling with eight freight cars of animals," says Popenko. She brings me to a 1:3 scale model of a railway line. It is a real train with a steam engine from one of the theater's famous shows. In it, 50 animals bought tickets and boarded the train, which then took them round and round. In the end, Durov grew tired of touring and bought a house in Moscow, putting all his animals in the backyard. After the 1917 revolution, Durov presented his theater to the state. In return and in recognition of his donation, he was appointed life-long head of the theater. Since then, the establishment has always been run by members of the Durov family. After Vladimir Durov's death, he was succeeded by his daughter Anna, who during the war, in 1943, produced the first show with animals. This may have been the world's first play in which animals acted alongside people. Since then, Durov’s Corner has become a full-fledged theater. We approach a stuffed anteater, standing on its hind legs, in a defensive position. It has put forward its foreclaws and looks as if it might bite you. “Anteaters are good-natured animals,” Popenko reassures me. “They do not have any teeth, so they only eat ants and termites. They have a long, up to 80 cm, sticky tongue, which they use to get ants right from inside anthills. The tongue moves very quickly, flicking 160 times per minute. It is of course a good-hearted animal, but it is not very smart." Once, the founder of the theater, Vladimir Durov, gave an anteater a rifle and left it to guard a post - the only occasion on which an anteater was taught to do something. Not having a very developed brain, they are not capable of much more than holding a rifle. Above the anteater, there is a photograph of a cheetah, which was clearly smarter than the anteater since Durov had taught it how to fire a rifle. "Durov introduced a new method of training animals,” says Popenko with pride. “Not with the use of a stick and a whip, but using treats for animals after they have performed a trick." However, with the anteater, providing the treats proved a challenge, as Durov was unable to obtain several kilograms of ants every day. So he invented a special diet for the anteater, consisting mainly of minced meat with milk and eggs. We are surrounded by numerous stuffed and mounted animals. These were Durov's favorites and performed important social functions. Here is his favorite pig, called Fintiflyushka (“Knick-Knack”), whom he harnessed to a carriage and once drove that carriage to take him to a restaurant. "He wanted to show that pigs could not only be eaten but could also be used in creative, productive labor," Popenko explains. And here are his favorite chimpanzees. Durov treated them not as animals to be trained but as children to be brought up. They could draw, light a match and a candle, they ate with a spoon at the dining table, slept in beds, used a chamber pot, washed their hands with soap before eating, could ride a tricycle and knew how to clean the floor with a mop. It is this anthropomorphic tradition that the theater adheres to still. The theater has two stages: a big one for large-scale productions with many changes of scenery, and a small one where shows for very young viewers are performed, usually on the same set. In one of the shows performed on the big stage, which is called The Princess's Whim, an evil stepmother sends her stepdaughter to collect snowdrops in a forest on New Year's Eve. In the magical forest, the girl meets different animals, who act in the play alongside humans: A hare shows the girl the way, then a wolf helps her out. There are also more conventional circus numbers woven into the plot. The small stage offers shows for a very young audience. One of them is based on the famous Russian fairy tale called The Giant Turnip. In it, an old man plants a turnip and it grows so big that neither the old man nor he together with his wife can pull it up. They call their dog to help, then their cat and finally a mouse and only with the help of the mouse, they all manage to pull the turnip up. 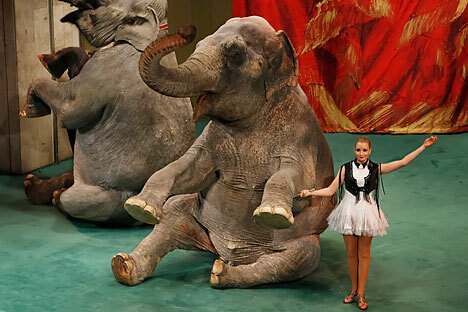 Should circuses and theaters stop using animals? There should be animals in circuses and theaters. Why? Because animal behavior and intellect cannot possibly be studied without being in contact with animals. It is only [by being] in constant contact with animals and in attempts to teach them something new that they can be properly studied. It is a science. That is why banning circuses from having animals would be detrimental for society. Humans cannot study wildlife only from a distance. On the other hand, there should of course be strict regulations as to how animals are kept in circuses, and in this respect, Russia still has a lot of work to do. Also, there should be adequate education and awareness programs that would prevent stories like the one of the killing of Marius the giraffe at a Danish zoo from being hyped and sensationalized. Russian zoos do not admit that they put down animals, although in fact they do. Whereas Denmark was not afraid of being misunderstood, since zoos cannot survive without putting down superfluous animals. It is scientifically justified. Why shouldn't children be aware of it? There is nothing immoral about it. What is immoral is to subject animals to suffering. Stuffed animals at Durov’s Corner are not a problem either from a moral or ethical point of view. After all, what is animal protection about? It is about saving animals from pain, fear, and suffering. It does not mean that animals should not be used in any way at all.